Sinbad is the heart of the southern portion of the gorgeous San Rafael Swell, offering more opportunities for camping, recreation and sightseeing than I could hope to document here. Of course, this site is about mustangs -- and occasionally their equine cousins, the wild burros of southern Utah -- so I'll mention just a few "other points of interest" toward the bottom of the page. 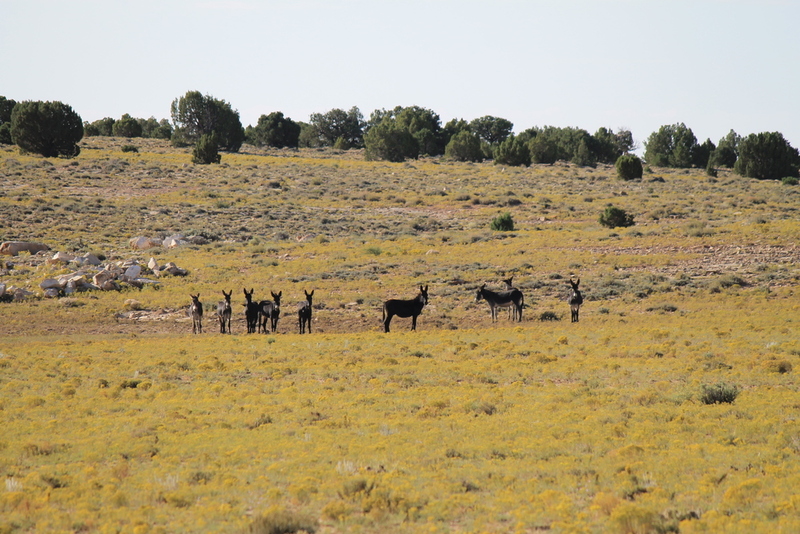 Prior to 2011, the Sinbad Herd Management Area included a small population of mustangs (about 40) and nearly twice as many wild burros (around 70). Since then, the management area boundaries appear to have been redrawn so that the adjacent Muddy Creek HMA encompasses the horses, leaving Sinbad entirely to the burros. 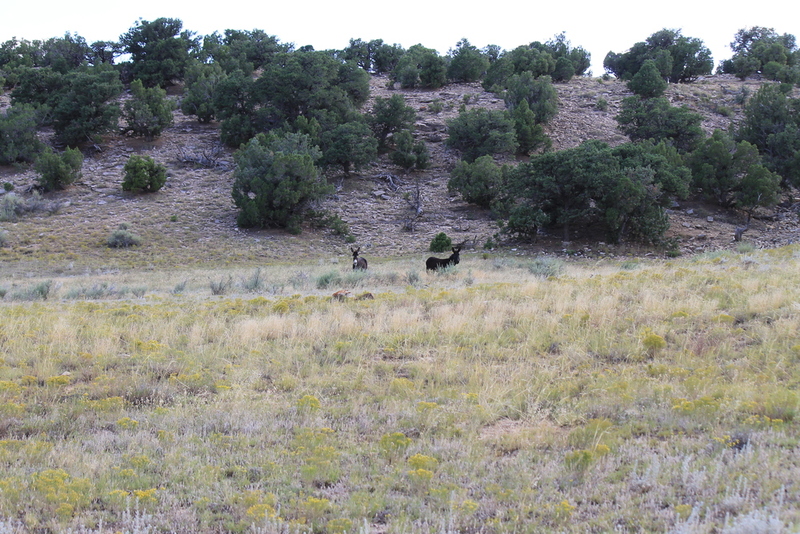 Some BLM maps suggest that Sinbad occupies two distinct areas, with the herd management area straddling US-70 just west of Spotted Wolf Canyon and a second unmanaged herd area overlapping an extension of Muddy Creek HMA east of Eagle Canyon. In any case, the access point from I-70 is the same for both the Sinbad HA and HMA, and I have yet to spot any mustangs east of Eagle Canyon. 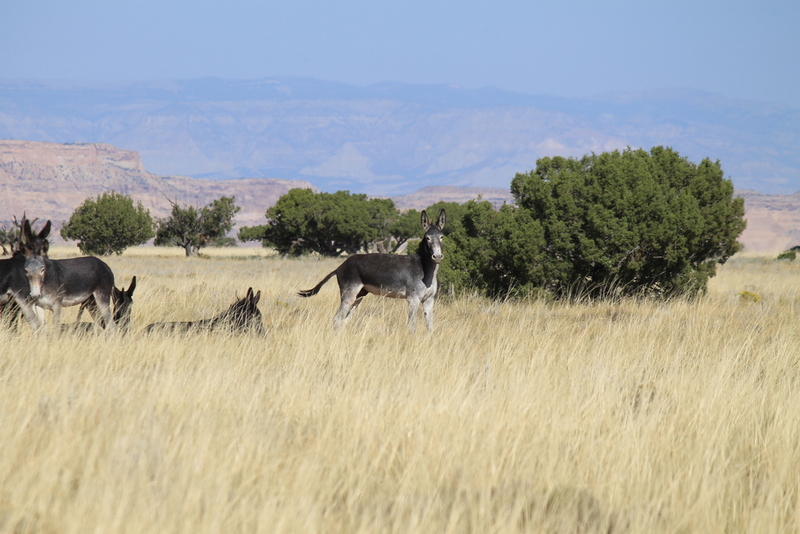 The Sinbad burros are easy to find, often visible from the interstate between Exit 131 (Sinbad Road) and Spotted Wolf Pass some ten miles to the east. The band in the photos below were grazing just beyond a barbed wire fence running beside the eastbound lanes of I-70. Exit 131 is the primary access point for several high-probability viewing locations. From the Wasatch Front, you have three options: Salina, Emery or Green River. Although the total mileage to all three of these refueling points is essentially the same (within two or three miles of one another), Salina is potentially the quickest route, as a large percentage of the trip is along I-15. However, we're only talking about 10 to 20 minutes, and the primary access point for this area -- Exit 131 along US 70 -- is most distant from Salina (76 miles to exit). Refueling in Emery (39 miles to exit) or Green River (30 miles to exit) saves gas for actually exploring the area and safely returning to civilization. Emery is the best option if you also plan to explore the Muddy Creek HMA, while Green River is preferable for looping in Robber's Roost. Opting for Green River also opens the possibility of visiting the Range Creek HMA, east of Price, on your southward journey. Most of this area is high-clearance 4WD country, but the pond just south of I-70 provides a great opportunity for just about any vehicle in dry conditions. Upon exiting, turn south onto Temple Mountain Road and follow as it turns westward to parallel the interstate for about 1.8 miles. The pond stands just over a mile down the road. Follow the road around the bend for another mile or so, watching for burros grazing south of the pond. Those equipped for rugged terrain can try the Jeep trail just south of the freeway exit. Watch for the narrow dirt road on your left immediately beyond the cattle guard. This trail runs parallel to I-70 for about 3/4 mile before turning southward. 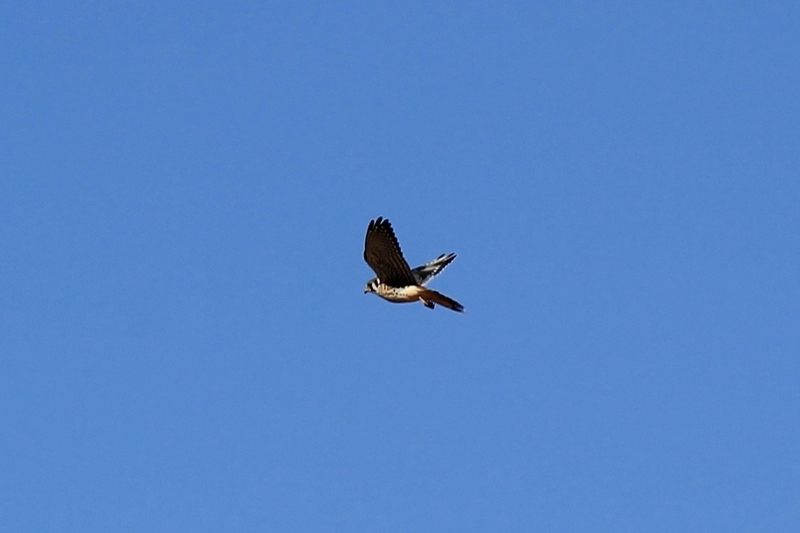 I spotted the pair pictured below along this two mile southward stretch. To reach the best viewing areas, you'll want to start on the north side of I-70, again from Exit 131. Follow Buckhorn Draw Road (paved) about 3.6 miles eastward, turning right on the dirt road toward Hyde Draw, and right again 1/4 mile later to pass under I-70 to the south side. Be prepared for mud and standing water throughout this area. Coming out of the viaduct, you'll immediately reach a crossroad presenting three options. Turning right will take you along a rather rugged Jeep trail, terminating about 1.5 miles to the west. The photos below were captured along this trail. Continuing straight through the crossroad leads to a waterhole about 1.5 miles directly south. The photos below were taken at this location. Turning left at the crossroad will take you on a beautiful 12 mile loop that drops down into the broad meadows east of Cliffdwellers Flat, passing another waterhole. The photos below were taken along this loop. The San Rafael Swell region is a popular destination for all sorts of outdoor adventures, from sightseers, campers and OHV riders to hikers, climbers and slot canyoneers. Click here for a map of the entire region, which can be saved as a pdf file and opened with high-resolution zoom capability. 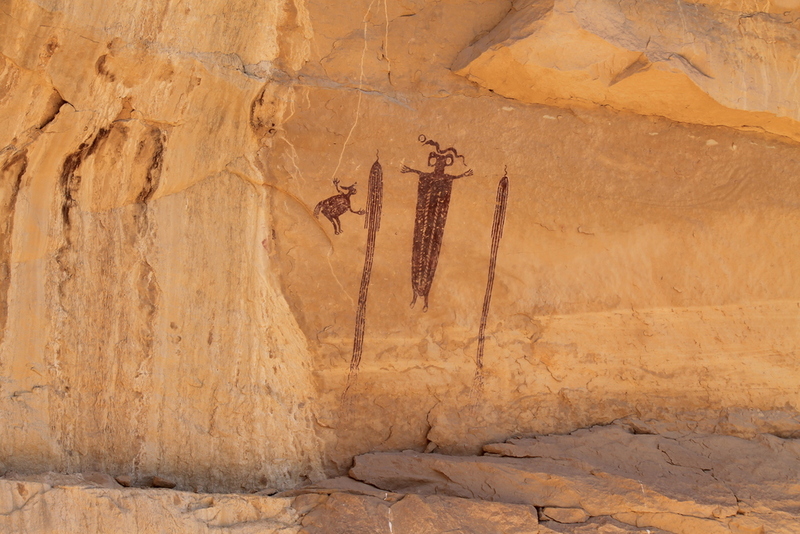 The Head of Sinbad pictograph panel stands north of I-70, but is accessed by turning southward at Exit 131 (Sinbad Road). The road seems friendly enough at the outset, but is very rough in spots, with the final approach amounting to a narrow, sandy ATV trail. Your family sedan won't get you there. To reach the panel, follow Temple Mountain Road for about 4 miles as it runs westward beside the interstate then turns south (keep an eye out for burros near the pond). Turn right at the sign, but be warned that this is the only route marker you will see for this site, so follow these directions carefully. Turn right when the road terminates at a T-intersection about a mile in. Turn right again when the road forks 1.7 miles down the road. The road forks again a mile later -- keep right and stay on the main road. You'll see a faded sign pointing toward Dutchman's Arch when the road forks again about 0.8 mile later. Follow the road to the right to pass under I-70. Entering the north side, the road immediately forks -- keep right again. Turn right on more time onto the ATV trail a quarter mile north, and follow this trail as it arcs northward again for about a mile to the log fence at the base of the cliff -- keep left at the fork near the halfway point. 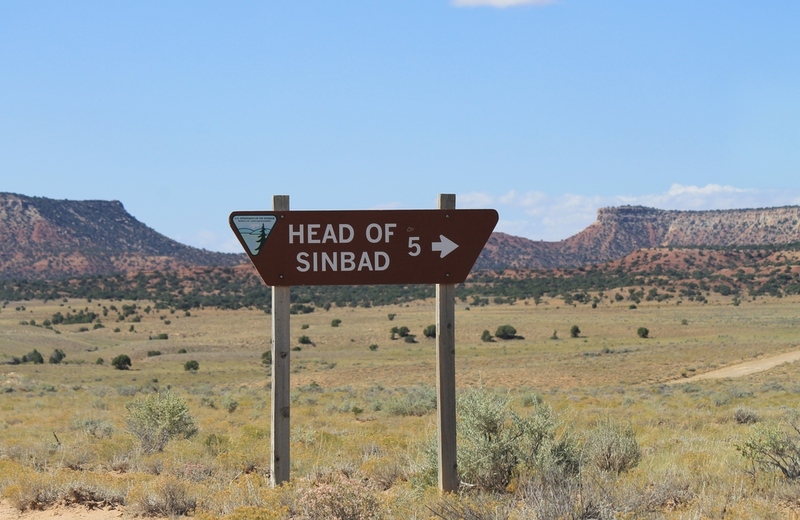 To summarize, starting at the BLM sign reading "Head of Sinbad 5" on Temple Mountain Road, turn right at every opportunity except the very last fork in the ATV trail. Goblin Valley State Park lies at the western edge of this region. Although generally accessed from UT-24, which branches southward from US-70 about 10.5 miles west of Green River, this park can also be accessed from the Swell's interior via Temple Mountain Road.